Despite improvements in dental care, millions of Americans suffer tooth loss – mostly due to tooth decay, periodontal disease, or injury. 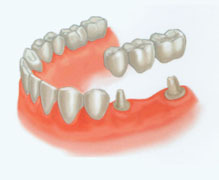 For many years, the only treatment options available for people with missing teeth were bridges and dentures. A dental implant is a titanium cylinder that is placed in the bone and once fully integrated replaces what was once the root of the tooth. 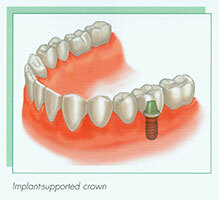 A crown is attached to the implant to simulate an individual tooth. Implants can replace an individual tooth or multiple teeth. Weisbard Dental offers explanations of the many advantages to dental implants, such as improved speech, appearance, and oral health, as well as overall support and durability. For information on fully edentulous implants, see our dentures page. Single implant and crown for missing lateral incisor. Veneers on canines and other lateral incisor. Nothing placed on front two teeth. Implant-supported, more stability, least rocking or movement. 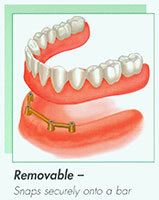 Single tooth replacement by cutting down adjacent teeth and cementing a fixed partial denture or “bridge”. ASIRD recommends Dr. Weisbard and her certified surgeons as your local dental implant team. Click on the button below to learn more how ASIRD and Dr. Weisbard work together. If you are interested in learning more about Dr. Weisbard’s surgeons and what they have done for their patients, click on the button below to view some video testimonials. There are many advantages to dental implants. A once loose-fitting denture can now be secured and stabilized with implants. Missing teeth allow surrounding teeth to drift and opposing teeth to move, changing the alignment of the teeth and allowing unnatural forces to shift teeth further. Improved function. With a full set of teeth, function is improved and digestion is improved. Maintains Bone. Dental Implants help to maintain bone levels. Durability. Implants are very durable. With good care, many implants last a lifetime. Success rates can vary, depending on where in the jaw the implants are placed. But, in general, dental implants have a success rate of up to 98%. With proper care, implants can last a lifetime. In most cases, anyone healthy enough to undergo a routine dental extraction or oral surgery can be considered for an implant procedure. Patients should have healthy gums and enough bone to hold the implant. They also must be committed to good oral hygiene and regular dental visits. Heavy smokers, people suffering from uncontrolled chronic disorders – such as diabetes or heart disease – or patients who have had radiation therapy to the head/neck area need to be evaluated on an individual basis. Other procedures including bone grafting may be necessary if adequate bone is not available. What is the process involved with dental implants? The first step in the process is the development of an individualized treatment plan. The plan addresses your specific needs and is prepared by Dr. Weisbard and the oral surgeon or periodontist. Next, the implant, a small post made of titanium, is placed into the bone. As the jawbone heals, it grows around the implanted metal post, anchoring it securely in the jaw. The healing process, called osseointegration, can take anywhere from 3 to 10 months. Once the implant has bonded to the jawbone, a small custom made connector post – called an abutment – is made and attached to the implant to securely hold the new tooth. To make your new tooth or teeth, we take impressions of your teeth and create a model. A replacement tooth, called a crown, is then attached to the custom abutment. With patients missing all their teeth, implants are placed, impressions are taken and a new denture is made to snap on to the implant post, giving you more stability and function. We will match the color of your new teeth to your natural teeth or shade of your choosing. Because the implant is secured within the jawbone, the replacement teeth look, feel, and function just like your own natural teeth. Most people who have received dental implants say that there is very little discomfort involved in the procedure. General and/or local anesthesia can be used during the procedure, and most patients report that implants involve less discomfort than a tooth extraction. IV sedation is also an option. After the dental implant, mild soreness can be treated with over-the-counter pain medications, such as Tylenol or Ibuprofen.